A bigger life needs a bigger gospel. A friend of mine was upset. She had just signed up for an online coaching experience. The marketing was strong and professional. The reputation of the coach was sterling. She even had some experience with previous products from this person that were great. So, she laid down a good chunk of money for the opportunity. The reality was different than the expectation. The course wasn’t strong. It was superficial and cliched. It wasn’t helpful. It definitely wasn’t worth the price of admission. My friend felt disappointed and, honestly, a little bit lied to. When a promise and its reality don’t line up, this is what we’re left with. Disappointment, frustration, disillusionment. I believe in the life-changing promise of following Jesus. But I’ve also seen in more than 40 years inside the Christian community that an awful lot of people never actually experience it. Periodically, sociological surveys are published that reveal the painful truth. Christian lives are essentially no different than non-Christian lives. Same struggles. Similar depressing moral choices. The same kinds of marriages, sometimes even worse. The reasons for this are many and deep, but one thing is apparent. The story we’re telling about Christianity is missing something. What’s missing and why does it matter? Think of it like this. Focusing in the wrong place. Adoption is a significant part of my life. I’m an adopted son. I also have an adopted son. I’ve been a part of adoption advocacy organizations. Adoption is very important to me. Now imagine that you and I sit down over coffee to chat. You ask, “What’s the greatest part of adoption?” I sit back, and stare off into the distance, and smile. I’ll bet that’s an argument you’ve never heard for adoption. It’s a strange perspective. But it’s just like the most common explanation of why following Jesus matters. In the most well-known story of Christianity we reduce all of life to two moments. First, there’s the moment we “get saved,” when we legally become a part of God’s family. Second, there’s the moment—sometime far off in the future—when our new identity keeps us out of hell. This explanation for following Jesus is just as absurd as my argument for adoption. Why? Isn’t it obvious? It ignores everything that happens in between! Adoption begins with the legal declaration. It certainly brings a life-long benefit to the adoptee. But that’s a shallow, superficial understanding! The joy of adoption is made up of the life in-between. Shared family experiences. Living together through crisis and joy. The adopted family learning that they can love someone who is not their blood with the same intensity. The adopted person learning that they are not alone in the world, that they are truly included. Adoption matters because of the relationship that happens everyday and the way that relationship plays out in the moments of real life. It is the very same with the Gospel. To reduce the gospel to the moment you get saved, and the benefit of escaping judgement is to leave out most of what Jesus taught. Doing so deprives our lives of purpose and joy. I suspect it’s also why most Christian’s lives just don’t seem abundant. This correction of the story isn’t trivial. What you believe about this dramatically alters how you live, and what you think is important. In my next post I’m going to talk about two different tellings of the Gospel, and the practical implications they have for our lives. I’m going to suggest that the Gospel Jesus taught is somewhat different than the Gospel you may have heard before. 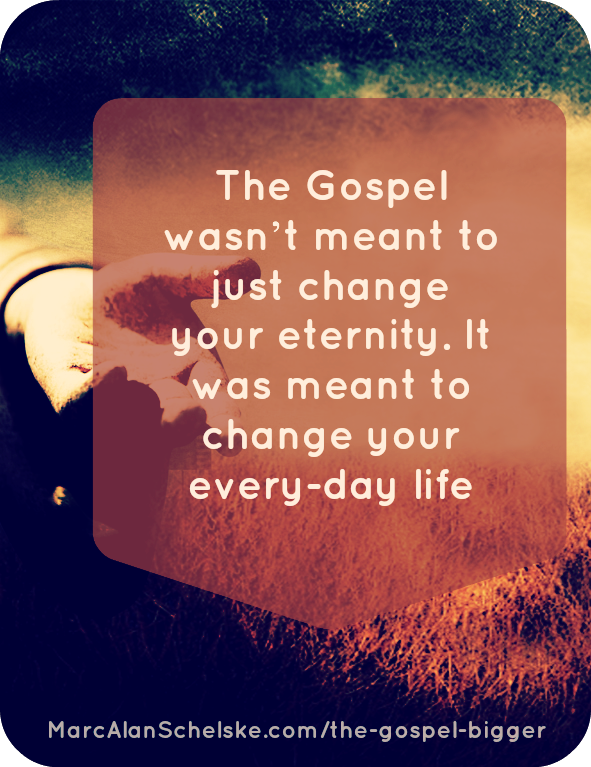 But before that, chew on this: The Gospel wasn’t meant to just change your eternity. It was meant to change your every-day life. 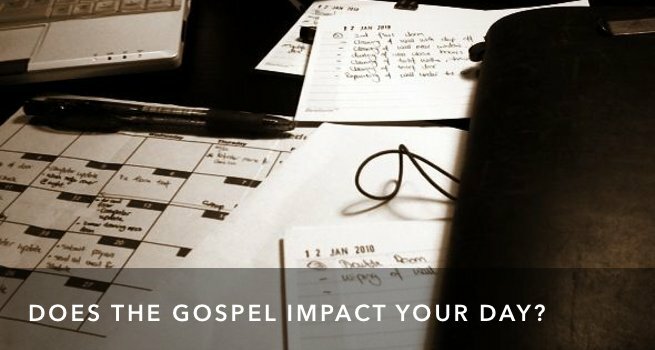 In as concise a manner as you can, write down what you believe the gospel is. Then reflect on this question: How has this understanding of the Gospel shaped your life and your relationships? How does your understanding of the Gospel make your life better, or worse? There are 5 comments Mind the Comment Policy.